If you live in one of the Mid Atlantic states, you know what I'm talking about. This friggin snow won't stop. Last week, my kids had two snow days in a row. Needless to say, they were ecstatic. Thursday and Friday off! Plus the weekend! Two weeks before, they had also had a double snow day, which came on top of a weekend and the three days off their school had given them to celebrate President's Day. (Why they need three weekdays to celebrate a holiday the rest of the world only needs one day to observe is a mystery). All in, they had had eleven days off and five days of school over the course of two plus half weeks. On Day One of last week's double snow day, my neighbor and I checked in with each other to discuss what complicated dish we would be making for dinner. That's what the bad weather has done to us: It makes us cook meals that we wouldn't ordinarily make just so we can pass the time while our children are milling about. I was making beef tenderloin and potato risotto. My neighbor was also making some kind of steak and starch. The potato risotto required a lot of standing and stirring but was delicious. Hot potatoes, combined with milk and cheese, taste pretty darn good at the end a long, cold day. And though my husband objected to the $32 we had spent on 24-ounces of steak, he backed off when I pointed out that that was $8/person and there would be plenty of leftovers for tomorrow. On Day Two, my happy-to-be-home vibe wore off. Our driveway still hadn't been plowed. The soles of my boots were wearing out. We needed fresh air. Our dog needed exercise. My younger son and I went sledding on a hill at the church near our house. We went with our plucky neighbors who had carved out a "run" down a flight of steps. This meant the kids could go over a "jump" as they flew down the slope. (No one ended up in the emergency room.) My neighbor made a snowman, with a belt made out of sticks. Our dogs frolicked. It was all cozy and delightful, even though my 13-year old refused to join us (Given the choice between playing in the snow and typing comments on the walls of his 530 friends on Face Book, he chooses the walls). The Purimschpiel was surprisingly terrific---surprising because if you take yourself to a religious institution in suburban New Jersey for free entertainment on a Saturday night, you never know what you're going to get. N. and Leora Perlman, Itzak Perlman's granddaughter, both played contestants in King Ahasuerus’s beauty contest. N. did a riff on The Little Mermaid and looked great in her turquoise mermaid's costume. Itzak Perlman's granddaughter sang a parody of "Colors of the World" from Pocahontas and was fantastic. Still, in the morning, the day stretched before us. My younger son had a basketball game but that would only take an hour. How to spend the rest of the day? Then, my older son announced he needed poster board and paper at Staples. I remembered we needed a new coffee pot. Off we went to Staples (not crowded) and then Bed Bath & Beyond (insane). The parking lot was so crowded I had to park in a snow bank. We made our way over to the coffee pots when my older son spotted the panini makers. I had actually been pining for a panini maker for a long time. I had this fantasy that a panini maker allowed you to take all your old, boring sandwich ingredients and turn them into an exciting new meal. The panini maker was $49.99, twice as much as the coffee carafe, but what the hell. It would provide something new to do, which on a snowy weekend day, is no small thing. I looked in the Cuisinart recipe booklet. There were all sorts of interesting recipes. Some called for crusty French bread and slices of ripe, firm tomatoes. The Cubano Sandwich called for thinly sliced ham, roast pork, and a dill pickle, none of which we had. The Muffuletta Panini listed sliced mozzarella, provolone, jalapeno stuffed olives, roasted red pepper, red onion and Genoa salami as the main ingredients. Nada, nada, nada. The Chicken Quesadilla Wraps called for chopped, cooked chicken. Come on people! It's a snowstorm! We're out of real food! Finally, I found the Smoked Turkey, Roasted Pepper & Baby Swiss Panini with Pesto Mayonnaise. We did not have "crusty country bread" or "artisan wheat bread." (In fact, we had no bread at all.) But we did have sliced turkey breast, sliced havarti cheese and pesto left over from last weekend. I knew there was some kind of bread product in the freezer: It turned out to be a package of frozen, whole-wheat tortillas. They were several months old but didn't have freezer burn so usable. I did the best I could with the ingredients we had and substituted havarti for Swiss. It took a minute to assemble the paninis, and four minutes to cook them. My older son was thrilled. My husband liked his so much he talked about it at dinner. (My younger son was out to lunch with his grandmother, eating an omelet.) I ate the mush that dripped onto the griddle: The combination of hot pesto, mayonnaise and cheese was awesome. Some days, it takes a lot to make someone happy. Some days, it just takes hot cheese. 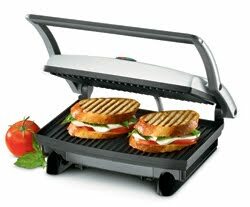 Preheat Panini maker. Combine mayo with pesto. Lightly brush one side of each slice of tortilla with olive oil. Lay two tortillas, oily sides down, on the grill. Spread half of pesto-mayonnaise mixture on tortillas. Layer turkey and cheese on tortillas. Spread the rest of the pesto-mayo on top of the cheese. Place remaining tortillas on top of pesto-mayo cheese. Dab a little olive oil on top of both tortillas. Close griddle and apply light pressure for 15 seconds, then grill paninis for 3-4 minutes. Cut in half on diagonal and serve right away. Melt butter in large heavy saucepan. Add the onion, cover, cook and stir occasionally until soft, about seven minutes. Add potato chunks and cayenne pepper; add salt and pepper to taste. Reduce the heat to medium and simmer until potatoes are tender, about 8 minutes. Add the milk or cream and simmer until potatoes are tender. Stir often, takes about ten minutes. Note: If you have small children and/or picky eaters who don't like strong tastes or little flecks of green stuff floating around their potatoes, skip the cayenne pepper and chives. Heat a saute pan, add a tablespoon of oil. Sprinkle steaks with kosher salt, a little pepper and chives. Add steaks, cook for 4-5 minutes each side.